Intimidator Wave 360 IRC brings a œwave of excitement to your next event. This dynamic effect features four independently controlled 12W RGBW LED moving heads on a single rotating base. 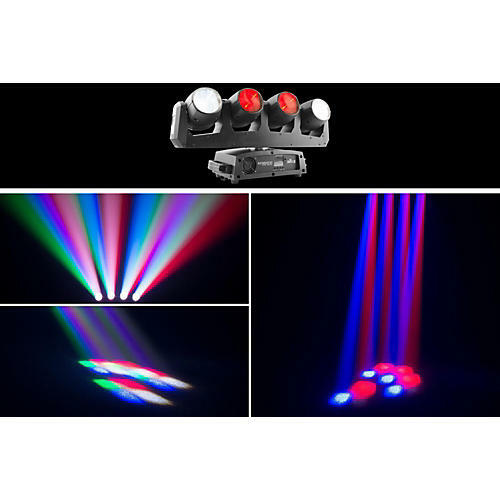 With its razor sharp beams, continuous pan rotation, adjustable tilt ranges and infinite color mixing capabilities, the Intimidator Wave 360 IRC produces the kind of astounding lightshows that set you apart from the pack. Up to four units (20 moving heads in all!) can be linked in automatic, sound or master-slave mode. An optional IRC-6 remote can be used for non-DMX control.